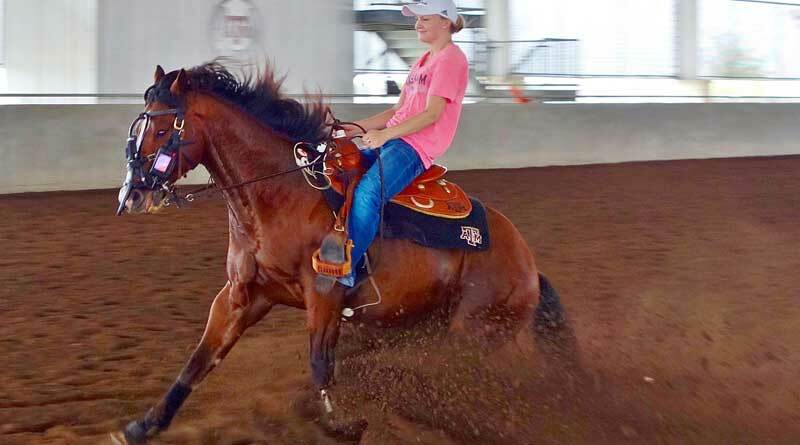 Subclinical abnormalities were detected frequently in a group of college-level reining horses who underwent a comprehensive exercise testing protocol, researchers in Texas report. The 16 horses who completed the assessment were all part of a western performance intercollegiate team. All of them had met their trainers’ expectations during the competitive season, although musculoskeletal problems had been diagnosed during the season in 13 of them. All were performing up to expectations at the time of examination, the study team noted. Cristobal Navas de Solis and his colleagues, in a paper recently published online in the journal Equine Veterinary Education, said exercise testing can be useful to evaluate poor performance, as a preventative medicine tool, and in assessing training progression. The study team from the Department of Large Animal Clinical Sciences at Texas A&M University noted that a comprehensive exercise test to evaluate common causes of poor performance had not been described in reining horses. The researchers developed a standardised testing protocol specifically for reining horses which assessed the musculoskeletal system, upper respiratory tract, lower respiratory tract, and cardiovascular system. The study team based its findings on historical questionnaires, a general physical examination of each horse, subjective lameness examinations, gait analysis using body-mounted inertial sensors, an endoscopic examination to check the airways, analysis of fluid flushed from the lungs through lavage, laboratory blood tests, ultrasound imaging of the heart, and resting and exercising electrocardiograms. “Subclinical abnormalities were detected frequently,” they reported. The musculoskeletal system was the most commonly affected, but heart and upper and lower airway abnormalities were also identified in some horses. All horses had some degree of lameness in a straight line. All had forelimb lameness, and two were assessed as lame in both front legs. Based on findings from the protocol, one horse underwent genetic testing and was shown to be affected by the GYS1 gene mutation. It was subsequently diagnosed with Equine Polysaccharide Storage Myopathy – an inheritable glycogen storage disease that can cause muscle fibre breakdown under exercise. Heart abnormalities included extra abnormal beats in one horse originating from the lower chambers immediately after galloping, another with a similar issue immediately after a stop, six with an intermittent second-degree atrioventricular block at rest, and six with intermittent irregular beats originating from the sinus node at rest or immediately after exercise. Five horses had sinus pauses during fast heart-rate deceleration. The results, they said, suggested that exercise tests may be useful to detect subclinical abnormalities in horses used for reining. Further evaluations of both normally and poorly performing horses were necessary to determine if exercise testing can improve the health, performance and welfare of horses used for reining, they added. The study also showed that diagnostic electrocardiograms can be recorded in horses during reining manoeuvres.